Brian Wang has a very interesting post based on economic projections by Rio Tinto, the international mining outfit. Rio Tinto clearly wants to know about future metal demands in the global economy. Of course this is important for Rio Tinto to know since it takes both time and a lot of capital to develop a new mine, and an accurate future projections is a way to control investment risks. Rio Tinto's projections are most interesting because they foresee the most significant driving force in the world economy as the development of China. The development of India will be a second major world economic driver. The Rio Tinto projection focuses on the next 15 years, and foresees rapid advances for both Chinese and Indian economies, with dramatic increases in personal income and standards of living. 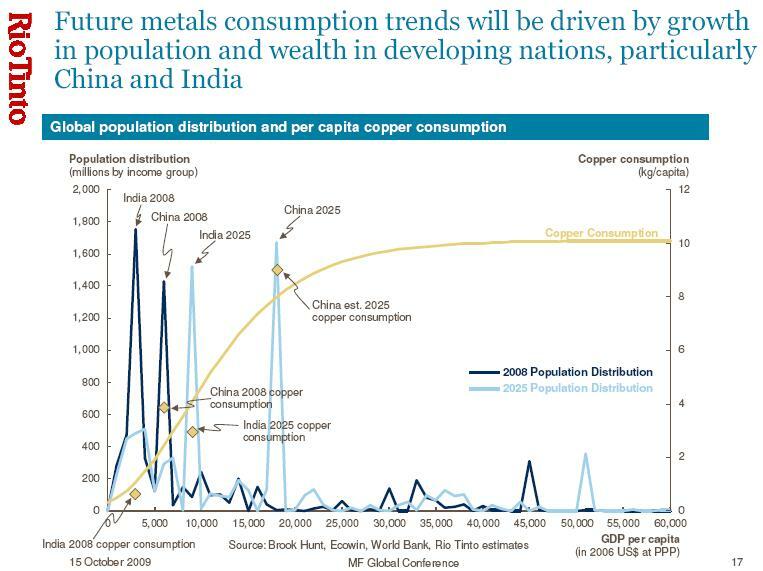 From Rio Tinto's perspective, the most important aspect of this picture is the demand for metals, and Rio Tinto for sees dramatic increases in Chinese and Indian demand for copper, and by implication for iron (steel) and aluminum. While it would be fascinating to speculate on the consequences of these developments on the peoples of China and the United States who will by 2025 find themselves in the middle of an energy crisis, brought on by a decline in the world supply of petroleum, and the certainty of Anthropogenic Global Warming. I am assuming that by 2025 reality will have caught up with the most confirmed AGW skeptic. What I am interested in is how the economic development of China and India will impact the American efforts to deal with this dual energy crisis. The Rio Tinto model suggests that Asian demand for the raw materials for developed societies, such as copper, steel, aluminum and cement would increase, and by implication there will be a steady increase in the price of these commodities. It will be plausible then the price in American dollars for copper, steel, aluminum and cement will be much higher than it is now, and that the ability of the United States to compete for these commodities on the international market will be seriously compromised by the large American international debt, especially the debt to China. The competitive disadvantage of the United States will adversely effect many of its options in dealing with the dual energy crisis, because the raw materials for building new energy producing resources will be subject to increasingly onerous dollar inflation of materials costs. These developments will preclude energy approaches that will require high levels materials inputs, and will favor energy sources that will use lower cost materials, or smaller material inputs. These factors would tend to favor nuclear energy over renewables for both obvious and hidden reasons. The obvious reason is that nuclear requires far less copper, steel, aluminum and cement by the kW of generating capacity than Wind and Solar generating facilities do. We can infer from Barry Brook's discussion in the previous link, that the material requirements for a large renewables development in the United States would make such a development unsustainable. There is nothing wrong with encouraging clean, renewable, domestically produced energy. But California’s proposition 7 “would, if approved, require California utilities to procure half of their power from renewable resources by 2025" . . .
since Californians by 2025 are going to be consuming about 1,000 gigawatt-hours per day, if proposition 7 is enacted, 500 gWh per day will have to come from wind and solar power. Solar power, installed – not including transmission or storage infrastructure – costs about $7.0 million per megawatt of output; this equates to $7.0 billion per gigawatt. If this sounds expensive, it is, but to get a truly accurate price you have to also take into account yield. Even in sunny California, solar energy (in terms of full-sun-equivalent hours), can only be harvested on average for 4.5 hours per day, which means to get 500 gWh of solar generated electricity each day in California, you would need to install 111 gigawatts of solar arrays (500/4.5), which would cost $777 billion dollars. Wind power, installed – is a better deal currently than solar – insofar as you can probably get costs down to around $2.5 million per megawatt of output, or $2.5 billion per gigawatt. But the yield figures are also not promising. In California there is widespread disagreement on the yield for wind power – credible estimates range from 10% (2.4 hours per day) to 25% (6.0 hours per day). Given the magnitude of what is being proposed, it would be prudent to project wind yields in California somewhere in the middle of this range, say 17.5%, or 4.2 hours per day. This means to get 500 gWh of wind generated electricity in California you would need to install 119 gigawatts of solar arrays (55/4.2), which would cost $297 billion dollars. It is tempting, and not entirely implausible, to expect prices for solar power to drop significantly over the next several years. But given the cost of balance of plant and installation labor, it is unlikely solar electricity is going to get measurably cheaper than wind power no matter how inexpensive the actual collector materials become. Moreover, the costs for new transmission lines and grid upgrades, the costs for massive energy storage units (since the sun and wind are only producing power during small portions of the day), and the costs for land aquisition, permitting and fighting environmentalist lawsuits will be substantial. For these reasons, estimating the total cost for California to deliver 50% renewable electricity at $300 billion is probably the very best case, if not fantastically optimistic. This is $20 billion per year for the next 15 years. Readers are encouraged to critique these projections. Ring, did not include the costr of materials inflations in his estimate of costs. transmission studies for wind and solar clients. Because the wind and solar and water and geothermal projects are not in the locations of the existing power plants, new lines will be needed. Looking at the graph on page 63, and carefully measuring scales on the graph, I estimate that there is 40,000 MW of wind and 40,000 MW of centralized solar on that graph. . . That leaves us needing 80,000 MW of new wind solar and geothermal generation just to serve California. I think an estimate of 500 miles from wind and solar resources to major load centers is reasonable. A 500 kV transmission line is rated at about 2000 MW max power. But you don't want to operate it at that power level because the losses are too high and there is no reserve capacity in the line to handle the first contingency problem. Therefore I will estimate we will load the new 500 kV lines to about 1500 MW on average. So we have 80,000 MW of renewable sources widely scattered around the Western System (WECC) with each carrying 1500 MW so that we need roughly 50 new 500 kV lines of 500 miles each, for a total length of 25,000 miles. The article assumes there is little solar power energy storage and it also assumes the wind be blowing at night. We know for sure that the solar power is not available at night so we are nearly totally dependent on wind for night time energy. You are going to ask about the geothermal energy. One geothermal project I recently worked on for determining the transmission access for looked like a good project until the geothermal energy extraction failed to work. Recently other geothermal projects have created human induced earthquakes. Geothermal energy seem less likely today than just a few years ago. So we are nearly totally dependent on wind energy for the nighttime CA energy as envisioned in the 100% renewables by 2030. If we plan for those few occurrences when there is no wind in the WECC system, we must interconnect WECC with the rest of the US so CA can draw power from other wind generators that do have wind (hopefully) outside the WECC area, such as the Texas coast and east of the rocky mountains where massive wind farms can be constructed. However we will need at least 40,000 MW of lines that I estimate will average 2000 miles in length. If we used 500 kV lines, we would need about 25 of these lines bridging from WECC to the US eastern grid and ERCOT and the total length would be about 50,000 miles. Of course, the increased cost of materials will effect the cost of transmission lines as well. Prestons estimate is far more parsimonious in its guess about the number of solar and wind installations require to meet California's electrical need, and given a system of the magnitude Ring foresaw to meet California's 2025 electrical needs, a far larger local transmission system would have been required. Given the nuclear power cost advantage of both China and India over the next 20 years, the energy future of the United States and indeed the economic future looks quite dismal without a major technological breakthrough. PV factory gate ASPs reached $2/Watt in Q3 and ASPs should decline another 20 cents/watt in Q4. The CSI data for installed costs is up around $6000 USD per kW but this should come down considerably as the integration market in California develops. Stay tuned. Anonymous, considering the absurdly small winter capacity factor for PV in Germany 3262 Euros per kW is far too expensive. And at a capacity factor of .20 in sunny southern California, $6000 is 5 times as expensive as nuclear power. California cannot meet its budget now. The CA government is captive to its own employees, things are going to get ugly before CA can recover. So that projected power generation deployment is not going to happen, it's not even going to start for years. There may be a a lot of hoopla to make it look like the politicians Are Doing Something, but there will be very little actual progress. So people and businesses will continue to leave, and all that projected growth will happen somewhere else. Switching topics, how much of installed solar PV cost is the cost of the PV cells? Larry, I have not checked the cost of PV panels recently, but they have dropped this year and are probably around $4 per watt now. Installed charges can run to more than $30,000 for a 5 kW system.